Research associate, NRPOP Lab, Faculty of Engineering and AppliedScience, Memorial University of Newfoundland, Canada. Due to thelarge areas and differences of climate conditions and the lack ofmeteorological data in China, there are many challenges for research on surfacewater in hydrologic cycle and the associated driven force. Currently,China is facing the pressures from both water resource scarcity and waterpollutions. The consequences of water pollution problem have been obviouslyrevealed in recent years. Due to the low frequencies and small number of monitoringfor non-point source pollutions, it becomes the challenge to understand the continuousspatial distributions of non-point source pollution in China. China MeteorologicalAssimilation Driving Datasets (CMADS) is developed based on China Land DataAssimilation System (CLDAS) and provide high resolution and quality meteorologicaldata for researchers. Applying CMADS can significantly reduce themeteorological input uncertainty for non-point source models and improve theperformance of non-point source modeling, since water resources and non-pointsource pollution can be more accurately localized. Besides, researchers canmake use of high resolution time series data from CMADS for spatial andtemporal scale analysis of meteorological data. CMADS present a basic andstandard meteorological data system, and researchers can conduct the related researchusing the same meteorological source for better and further comparison studiesin the future. We expect that CMADS can provide the reliable data forresearchers with confidence and convenience. Rejuvenating thecountry through science and technology, the essential data and information areessential. I am glad to see our work can be shared with different colleaguesfor the research purposes. CMADS datasets have been developed under a year, andhave been applied to different areas. I hope all the science and technology colleaguescan make use of this datasets for their research. CMADS has been released for over 10 months.From April 2016, we began to share this datasets on “National Earth System ScienceData Sharing Infrastructure” (http://westdc.westgis.ac.cn/).We have received 732 requests nationally and 14985 page views till Feb 12,2017. From the statistics, the requests reached the peak on May, 2016 (138persons/month). Around August, 2016 (around summer vacation time), the requestshave reached the first peak (30 persons/month), and then the number of requestsis fluctuated. 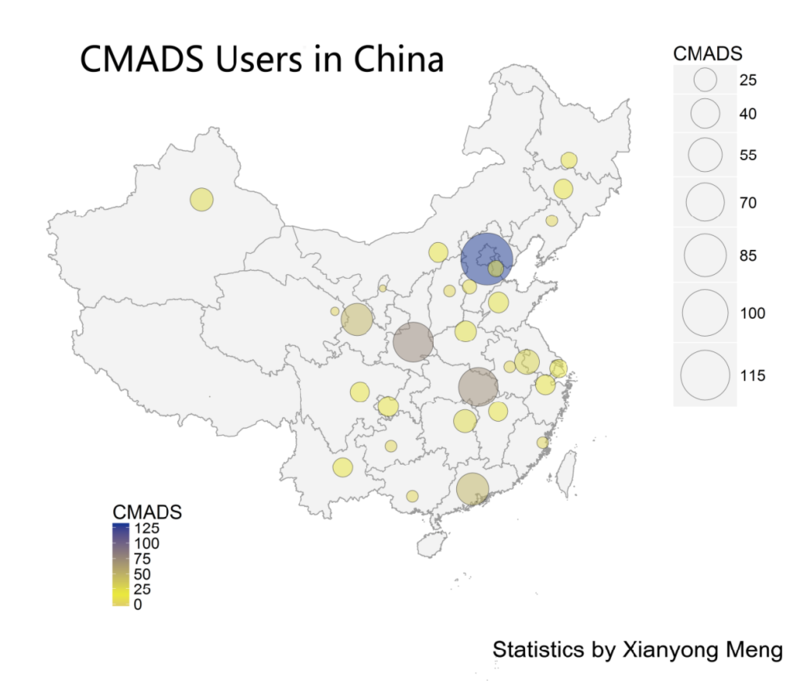 In order tounderstand the distribution of CMADS Chinese user, we have randomly picked 708application forms from researchers and analyzed them. The most requests arefrom six provinces/cities, including Beijing (130 requests), Shaanxi (76 requests),Hubei (72 requests), Guangdong (48 requests), Gansu (47 requests) and Jiangsu(28 requests). The other requests from: Xinjiang, Hunan, Henan, Shandong,Chongqing, Jilin, Inner Mongolia, Zhejiang, Jiangxi, Sichuan, Yunnan, Shanghai,Heilongjiang, Tianjin, Hebei, Liaoning, Shanxi, Anhui, Guizhou, Fujian,Guangxi, Qinghai, Ningxia. There are no requests from following provinces: Macao,Nanhai, Taiwan, Tibet, Hongkong (Figure 3). 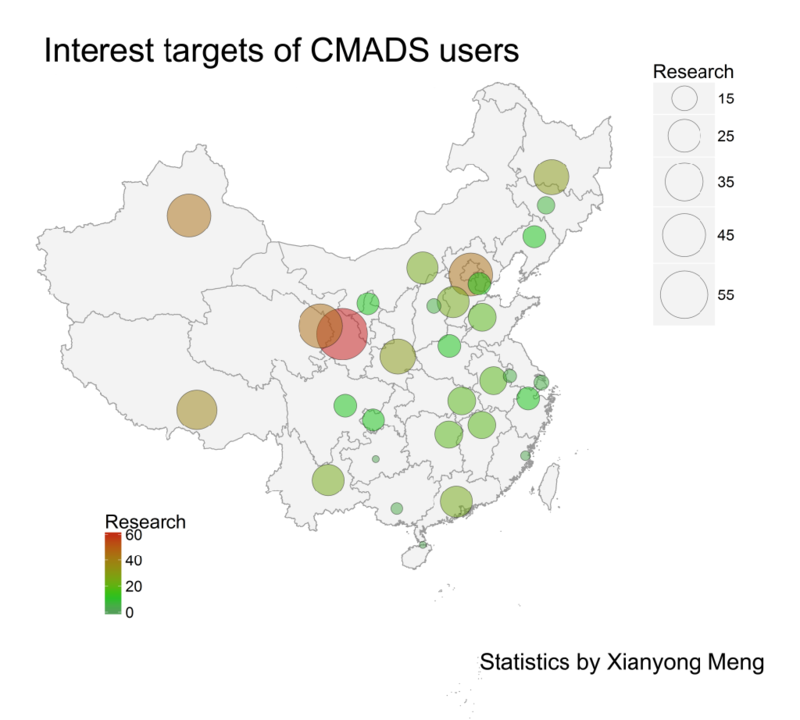 We also summarizedthe interested study areas of the Chinese CMADS users, the results showed thatnorthwestern area, southwestern area, north China, and northeastern areas aremost interested areas. However, the number of traditional meteorological stationsin these areas is less than that in Central China, Eastern China, and SouthernChina areas. The six mostinterested study areas include Gansu (63 requests), Qinghai (46 requests),Xinjiang (45 requests), Beijing (44 requests), Tibet (38 requests). Other interestedprovinces include, Heilongjiang, Shaanxi, Inner Mongolia, Hebei, Guangdong,Yunnan, Shandong, Anhui, Hunan, Jiangxi, Hubei, Tianjin, Chongqing, Liaoning,Henan, Ningxia, Zhejiang, Sichuan, Jilin, Shanghai, Shanxi, Jiangsu, Guangxi.Fujian, Guizhou, Hainan. 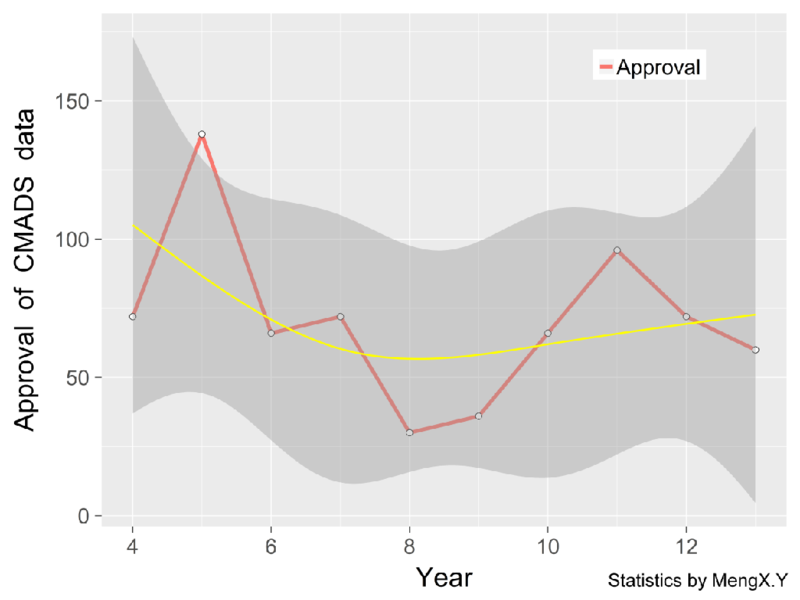 We also record different research areas where CMADS wereapplied (Figure 6). 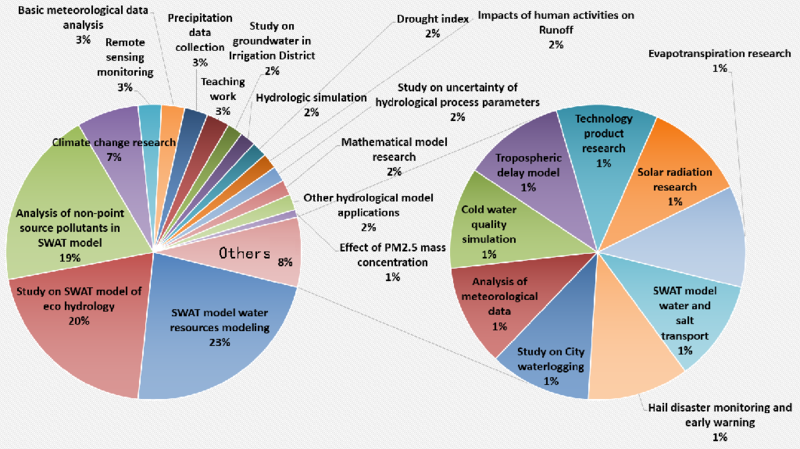 The results showedthat the most research areas where CMADS was applied mainly include: waterresource modeling (23%), eco-hydrology study (20%), nonpoint source pollutionresearch (19%), and climate change (7%). Other research areas include:assistance for remote sensing monitoring (3%), precipitation data collection(3%), teaching purposes (3%), groundwater research (2%), hydrological modelingin cool regions (2%), calculations for drought index (2%), Human activitiesimpacts on surface runoff (2%), Parameters uncertainty analysis forhydrological models (2%), mathematical modeling research (2%), otherhydrological studies (2%), PM 2.5 concentration research (1%), SWAT water andsalt transport (1%), hailstone disaster monitoring and prediction (1%), urbaninland inundation research (1%), multiple factor analysis for meteorologicaldata (1%), water quality modeling in cold regions (1%), troposphere delaymodeling (1%), technological products research (1%), solar radiation research(1%), and evapotranspiration research (1%). In order to show the differences and features of the research, this report doesnot classify characteristic features of different research into major classification.For example, the hydrological modeling and water quality modeling in coldregions were not differentiated into water resource modeling and nonpointsource pollution, separately. Beijing Jingshui River (Beijing) Engineering Consulting Co. Ltd.
Beijing Wright Cyber Technology Services Ltd.
Shang Zheng (Beijing) Information Technology Co., Ltd. The Yellow River survey planning and Design Co., Ltd.